Indie booksellers are breaking out the rainbows to mark Pride Month. Here are just a few of the many snapshots of displays and events shared by booksellers on social media. Authors and customers are showing their support for indie bookstores in North Carolina as booksellers around the state open their doors to create venues for discussion and education about House Bill 2. North Carolina author and indie bookstore champion Sara Gruen is responding to the state’s controversial House Bill 2 by coordinating the “Kill the Bill” author reading and fundraiser, to be held May 18. 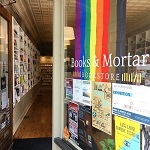 Independent booksellers throughout North Carolina are speaking out against the discriminatory nature of House Bill 2 and addressing its impact on their businesses.